An open meadow bounded by Kezar Drive, Lincoln, and Aguello. The Triangle contains a discus cage and is used by local high schools for practice and also for informal games and dog play. 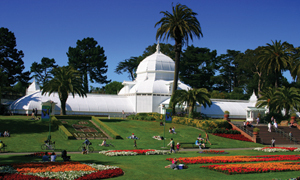 Friends of Kezar Triangle is a Park Partner group working to improve the condition of the triangle with plantings to buffer traffic, native plants, and interactive temporary eco art installations to add interest to the area.